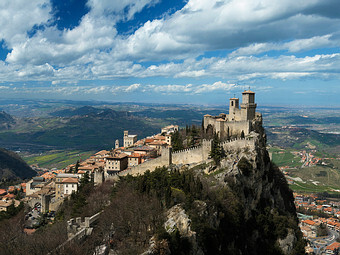 On July 7, 2008 UNESCO’s Committee, whose members gathered in Quebec, Canada, decided unanimously to include the old towns of San Marino and Borgo Maggiore and the nearby Mount Titano in the prestigious List of World Heritage Sites. This recognition has significant importance for the Republic of San Marino, the oldest republic in the world, which still retains its original values of authenticity and identity. The universal value given to this fascinating City-State, rising uniquely on the top of Mount Titano in its Medieval frame, is to bear witness to a living civilization which has developed a free democratic historical pathway through its own institutions, the symbiosis of intangible heritage, represented by century-old traditions, like that of being governed by two Captains Regent, and tangible heritance made of ancient buildings which still host traditional ceremonies in their original form. Also the natural wonders of Mount Titano assume particular relevance in a landscape of rare beauty. The portion of territory inscribed covers an area of approximately 55 hectares. It comprises San Marino’s Old Town, the three Towers (Guaita, Cesta and Montale), the whole Mount Titano, Borgo Maggiore’s Old Town and the Rock (an enchanting natural area at the foot of Mount Titano). Not to be missed are the most important monuments and buildings of the City-State, such as the Basilica of St. Marinus, the monasteries of St. Francis and St. Clare, the Public Palace, the Titano Theatre, the fortified city walls with the ancient sentry posts and the historical buildings in the peculiar streets.